I have neglected to do a proper weekly wrap for a few weeks, I can attribute this to the fact I have dropped the ball a bit with my training and had not a great deal to report, so I got my head back in the game and managed to get myself moving this week and keep going. Monday – I returned to my Indoor Rowing PT session and although not feeling entirely motivated I managed to do a workout that inflicted some pain on ye ole muscles the following day. Tuesday – I tossed up between going on an expedition to IKEA and doing a session at the gym. I needed things from IKEA for our home renovations and being that it is an hour trip each way and about 3 hours to venture around the store it truly was an expedition with Miss 3.5 in tow. So the end result is I ditched a gym session and went shopping. Sometimes IKEA is the winner. Wednesday – I really wanted to do a workout to make up for yesterday’s shopping trip but work got in the way, I should have no excuses but life does get in the way. Thursday – Anzac Day I had a call from some friends to say they were at our local Café, so I rounded up the family on the bikes and we headed down and had a drink and a play at the park, then we headed off for a bike ride. Miss 3 was very whingy and I only managed to get about 3k before the whinging drove me mad and I turned around, so a 6k ride was all we did. Friday – I had a late start at work so headed to the gym to tackle my new weights session, so I did a 10 minute warm up on the Crosstrainer and then managed to do 3 sets of 10 of my new program and even bumped 1 of my weights up. Saturday – I could feel the pain from yesterday’s weights but I did make an effort to get to a 7am boxing class. I found a good boxing buddy of similar level and fitness which makes a big difference to the class. Sunday – back to home renovations and moving boxes and boxes of stuff and furniture to rip up carpet in 2 rooms, we managed to get 1 room done entirely and remove all the nails and tacks. We have to get the other room done this week as the floors are being sanded next weekend. So with 3 good sessions with my gym and PT and lots of incidental exercise I feel like I have got back on track. My goal for this week is to keep this up and add in that extra session instead of shopping. This entry was posted in Fitness, My Journey and tagged bike, boxing, ikea, indoor rowing, weights by admin. Bookmark the permalink. Hey, walking around Ikea for 3 hours IS exercise! lol. That place is huge!! Good to see you’re back on track with your training Rach. Loving the big pic of Miss E too. Lydia C. Lee recently posted..What I learnt from Die Hard. Looks like IKEA gave you a pretty good workout anyway! Sounds like an impressively exercisery week; well done. Wow, that made me tired just reading it! Well done for getting back into it – once you let yourself ease up getting back out the door again can be the hardest part! Moving and Renovations would be such a good work out let alone the Gym Sessions! 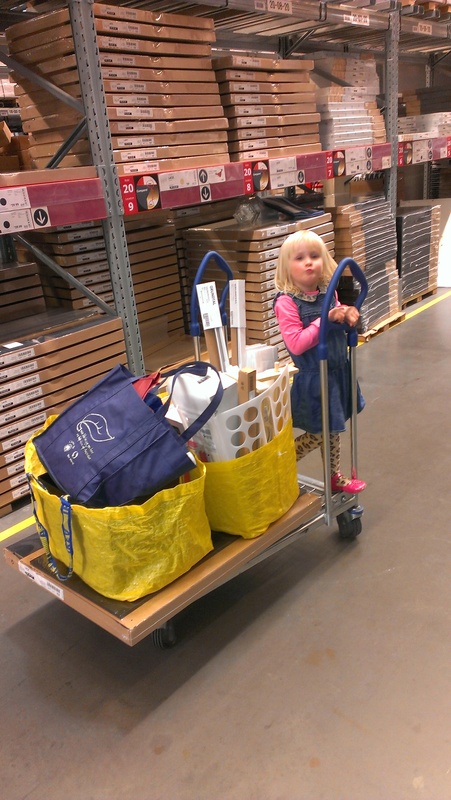 Ikea is always a winner – but that place is so huge that you got your workout walking around it pushing the big trolley! Love those leggings on little miss!